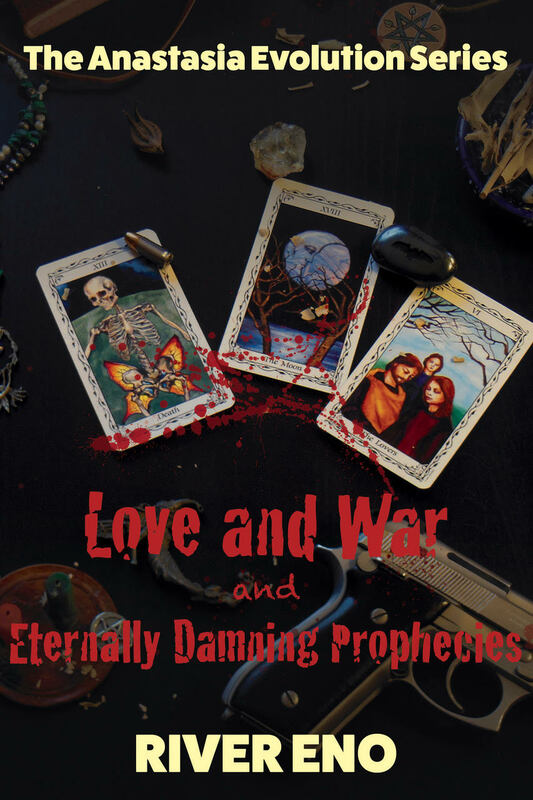 LOVE AND WAR — AND ETERNALLY DAMNING PROPHECIES - A BOOK WRITING EXPERIENCE - The Rising River . . .
click here to go to amazon and look inside!! Romeo marched into General Galen’s chambers gripping the bottom end of the transfer papers given to him moments before. Galen looked up from what he was doing. He ran both hands over his dark hair, pulled back and clubbed at the nape of his neck, making sure any stray pieces were caught behind his ears. “I can’t stand it when you presume to know what I need.” Romeo waved the official documents at him. “She will be good for you,” Galen smiled. ​Galen opened his mouth, only to be cut off by a hand gesture. Galen nodded, looking a little exhausted by Romeo’s attitude. Romeo knew how it angered Galen when he spoke of their relationship in that way. Galen put a hand on the back of Romeo’s head and the other on the chair’s arm. He kissed the younger man’s forehead and then set a series of small kisses on his cheek. Romeo turned his face so his lips touched the man that converted him -- the man who could infuriate him and yet make him feel as no other person or vampire could. He kissed the vampire that would die for him, and he knew he couldn’t deny him no matter how much he wanted to. The soft touch of Galen’s fingers on the back of his neck was so relaxing it sent chills down his spine. “Fuuuck you,” said Romeo, trying not to smile. The bell chimed and the door to General Galen’s chambers opened. A woman -- no, a girl -- dressed in urban fatigues, a black long-sleeved button-down shirt, and tie closed the door and walked to the last row of empty chairs awaiting cadets. She looked around the room and then at the two men looking at her. She set her backpack on the floor and fell into military stance. Romeo glanced at Galen and then back to the girl. He didn’t know her, but he thought she was attractive, even if a little odd looking. Her hair was a short, black mess, as if she hadn’t combed it that day, or ever. Her ears were small, maybe slightly pointed, although it was hard to tell with so many earrings trailing the edge. She didn’t have overly large eyes, but he could see them just fine. They were greenish and a bit wider set than average. Her jaw was strong, but not like a man’s, and she had a ring in her nose and bottom lip. “Vacation?” asked Romeo, glaring in her direction. Suddenly he smelled something so wonderful, but so strangely out of place it made him pause. It wafted around the room the way good cooking tends to move slowly throughout the house. Only this smell punctured its way into his brain the way the metallic odor of blood pushes aside most other thoughts. It was a smell he loved. The scent of deep woods, of swamp oak, cedar, and the honeyed pine of cottonwood buds. It was a damp smell, as when the rain saturates the earth, matting the leaves to the ground in clumps. It brought back memories of childhood and family and young love.